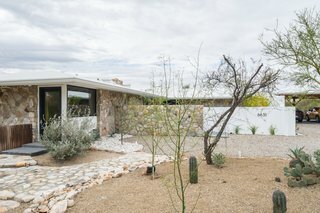 We gave the landscape surrounding this mid-century modern home a complete face-lift, replacing what was once all gravel and concrete with a dynamic landscape, studded with desert plants and with many areas to kick back and relax. The design brings the outdoors in with living room windows that look out onto specimen cactus, inviting seating areas, and views to the Sonoran desert. As part of the front yard redesign, we enclosed an outdoor room to increase privacy and give a sense of arrival to the home. In the backyard, we remodeled the existing pool, adding a shallow wadding area for lounging while partially submerged in the water, and adding multiple areas for seating such as hanging day beds from the covered porch and an area for outdoor dining. uploaded Modern Meets Boho through Add A Home.